Lock in a great price for Kariega Game Reserve Main Lodge – rated 9.1 by recent guests! Everyone was extremely helpful, knowledgeable and friendly. The food was great. We loved Melissa, our guide. We saw lots of animals. The game drives were as varied as the topography- hills on one side with the predators and open savanna on the other with the gazelle,giraffe etc. Our guide was most informative and observant of what we wanted to catch a glimpse of! The dining area was comfortable with fires burning during the early mornings and evenings. The food was more than plentiful with choices to meet every kind of palette! Bungalows were expansive, comfortable with wonderful verandas overlooking the mountain and alley below! 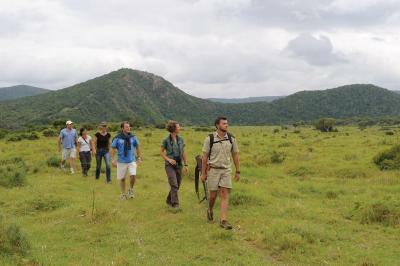 Wonderful safari experience with very knowledgeable guide. Every meal was great. Chalet was large and very comfortable. Very helpful and friendly staff. 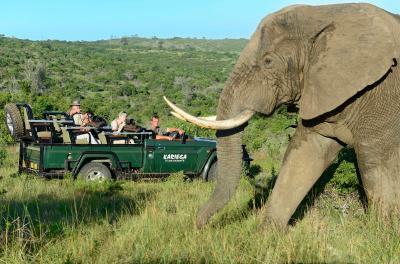 Great game drives with our guide Trust, incredible what we saw on just two drives. Good food and really pleasant lodge. 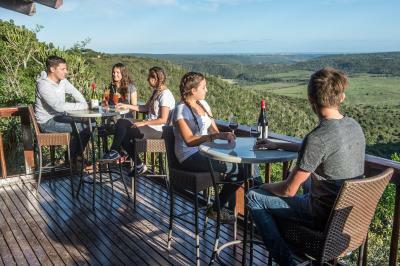 Kariega Game Reserve Main Lodge This rating is a reflection of how the property compares to the industry standard when it comes to price, facilities and services available. It's based on a self-evaluation by the property. Use this rating to help choose your stay! 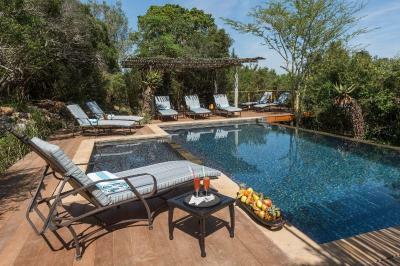 Located in the Kariega Game Reserve Main Lodge, 8.7 mi from Kenton-on-Sea, this family-owned and private game reserve features an outdoor pool, restaurant and bar. Free WiFi is available. 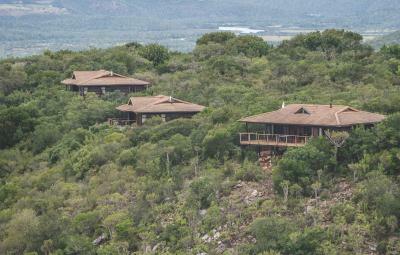 The spacious, air-conditioned chalets feature a private viewing deck offering views of the valley and bush. 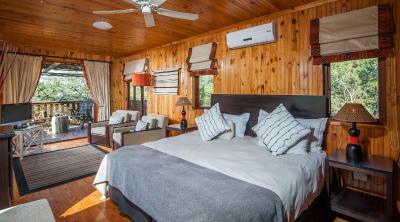 Each chalet has a lounge area, flat-screen satellite TV, fireplace and tea-and-coffee-making facilities. The private bathrooms include either a shower or bath and free toiletries are provided. 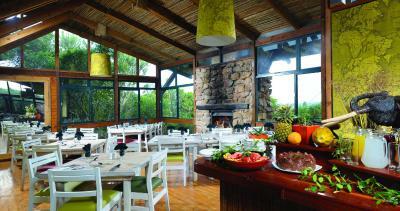 At Kariega Game Reserve Main Lodge breakfast, lunch and dinner is included and beverages are available at a charge. There are 2 game drives daily that are included and other activities range from river cruises, walking safaris and canoeing. The lodge features a spa and wellness center, treatments can be arranged upon request. Port Elizabeth International Airport is 83 mi away. 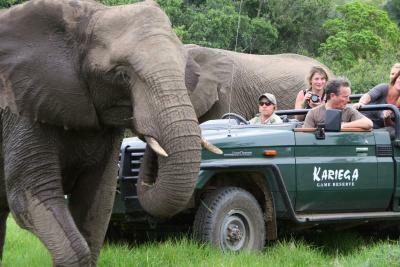 When would you like to stay at Kariega Game Reserve Main Lodge? 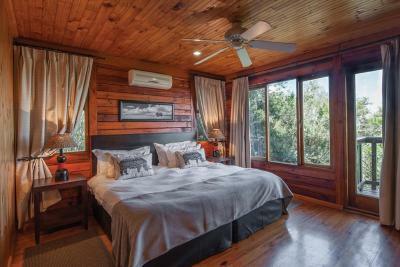 This elegant and air-conditioned chalet features wooden interiors and offers a balcony with a view. It has a private entrance, fireplace and air conditioning. 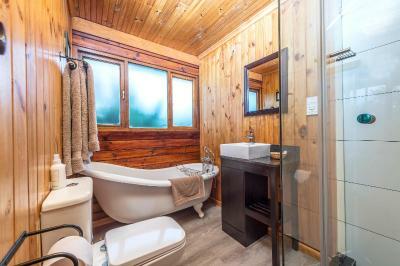 This spacious 3-bedroom chalet features a living area, fireplace, satellite TV and a viewing deck. All bedrooms are en suite and air conditioned. 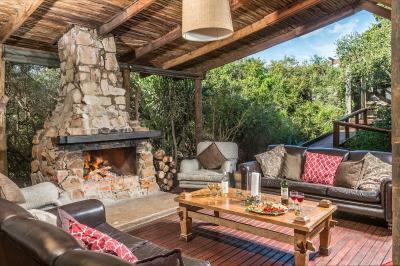 House Rules Kariega Game Reserve Main Lodge takes special requests – add in the next step! 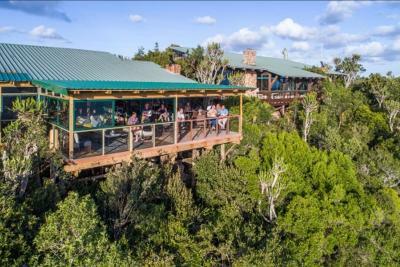 Kariega Game Reserve Main Lodge accepts these cards and reserves the right to temporarily hold an amount prior to arrival. 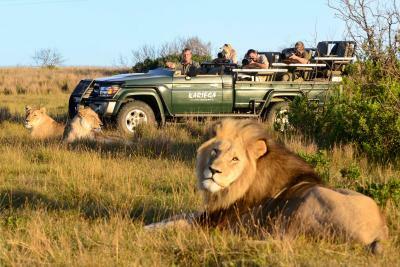 Please inform Kariega Game Reserve Main Lodge of your expected arrival time in advance. You can use the Special Requests box when booking, or contact the property directly using the contact details in your confirmation. Our booking was for 3 rooms but we were allocated a 2 room property. This didn’t worry us but when I mentioned this as we left the receptionist just shrugged her shoulders. No WiFi in rooms We were in No11 and the noise from the generator was quite bad. We were quite happy with everything. Having to sit with the safari group for meals. It didn't seem to be an option not to do so. Maybe a fan in the main room? The view from the property was excellent. 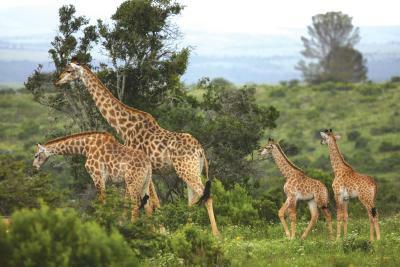 The staff were very helpful and the variety of animals to see on safari was great. We lost cash after our room was cleaned. We reported this to lodge management. The lounge area is a bit too open for the winter cold despite there being two fireplaces. Cold draughts whipped in at times and the only partially enclosed section had no fireplace.